Ever since the inception of the super-middleweight division, American and British boxers have dominated it’s rankings and outstanding bouts. From Sugar Ray Leonard to Andre Ward, Joe Calzaghe to Callum Smith, super-middle has been one of the great divisions for boxers on either side of the Atlantic, and although we never got James Toney vs. Benn or Chris Eubank the final year of the teens, the 10’s, the tenties? Whatever the proper name for this decade is, it could be about to signal the biggest conflict between the US and Great Britain since the 1700’s. After the roaring success of the World Boxing Super Series which concluded last September, there was a worry that the division might hit a lull in excitement. Worry no more. Where 2018 was the year of the cruiserweights, or more specifically, the year of Usyk, 2019 is set to be the year of the 168lbers. 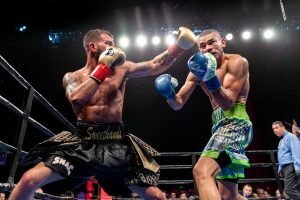 Caleb Plant was the first to make his mark on the division this year when, thirteen days into 2019, the Tennessee-native dominated IBF champion, Jose Uzcategui, dropping him twice en route to a comfortable twelve-round decision. He joined titlists Callum Smith (WBC & Ring) as well as then WBO champ, Gilberto Ramirez. Despite conflicting reports it appears Ramirez has vacated and is making the move up to light-heavyweight which has opened the door for another Brit to enter the title scene. At the time of writing, Billy Joe Saunders will fight Shefat Isufi in April for the WBO 168lb belt. If Saunders wins, as is expected he will enter the super-middle scene just after his past adversary, Chris Eubank Jr pulled off a career-best performance to defeat former world title holder, James DeGale. Last Saturday, Eubank dominated DeGale across twelve rounds. It was very reminiscent of Plant’s performance vs. Uzcategui. Chris dropped DeGale twice en route to a unanimous decision win, which turned out to be a little too close on the official scorecards – Howard Foster, it’s time to call it a day – But despite the cards, the IBO champion’s performance and general fighting style and intrigue means nobody will forget him when talking about the biggest fights that can be made in the division. A couple of hours after Eubank pulled off the slight upset over British rival, DeGale, brother of a former DeGale opponent, Anthony Dirrell was announcing himself back into view with a split – and slightly controversial – decision win over Avni Yildrim. The curious career of Dirrell continues. His only pro-defeat has come at the hands of Badou Jack back in 2015, and despite proving himself to be just above fringe level multiple times, including a 1st round KO of former champion, Caleb Truax; inactivity has seriously hampered the Michigan boxer. But with the top 10 looking as it currently does, it’s gonna be difficult to find a fight that won’t define the top super-middleweight’s careers. So let’s assume that Ramirez has moved up to light-heavy and Billy Joe Saunders will fight and win the vacated WBO – sorry Shefat. I’ll publicly apologize if you beat Saunders in April – then the 168lb scene is set to draw it’s battle-lines in a dysfunctional US vs. UK way. On one side of the Atlantic: Caleb Plant, the unbeaten IBF champion; alongside Anthony Dirrell, WBC titlist with just one defeat on his record and almost forgotten. On the other we have: Callum Smith, WBA and Ring king, arguably the only man who has a legitimate claim to being #1 in the division; Then Chris Eubank Jr, holder of the minor IBO belt but more importantly the victor over DeGale; and Billy Joe Saunders, the unproven entity at 168 but it feels safe to assume he’ll fit in nicely considering his style of technical boxing. But don’t forget the US wildcard: former WBC champion, David Benavidez lurking in the background, itching to gain back his title and claim supremacy. David at just 22-years old lost his belt outside the ring and based on the evidence of his past performances, a switched-on Benavidez is a world class fighter. In the 90’s the division was on the verge of a Roy Jones Jr/Toney/Benn/Eubank round robin that never occurred. When you look at the world champions and challengers right now, it will be just as much of a disappointment in two years if we’re not talking about the Smith/Plant/Eubank/Dirrell/Saunders/Benavidez wars of 2019. Somebody give Kalle Sauerland a call for a WBSS Super-Middleweight 2 ASAP. As the British Boxing scene continues to grow from strength to strength, this new weekly feature will highlight all the news, views and fight previews from the Great British circuit. Enjoy! 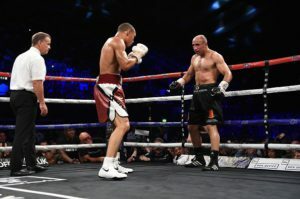 On Saturday night, the enigmatic Chris Eubank Jr defended his IBO Super-Middleweight crown against German veteran “King” Arthur Abraham at the SSE Arena in London. Many had foreseen the outcome of the fight as the cocky, charismatic Eubank dominated his way to a landslide points decision as the weary Abraham had no answer for the Brit’s speed and punch volume. In victory, Eubank (27) has now confirmed his place in the forthcoming World Boxing Super Series otherwise known as the “Muhammad Ali Trophy”, a mouth-watering eight-man tournament starring some of the main players in the 168lbs division. As third seed, Eubank will have home advantage against unbeaten Turkish prospect Avni Yildirim. Eubank is one of four Britons who will feature in the tournament, alongside Jamie Cox, WBA Super Champion George Groves and pre-tournament favourite, Callum Smith. Elsewhere in the UK, WBO Middleweight Champion Billy Joe Saunders is set to defend his crown against American southpaw, Willie Monroe Jr. Monroe Jr is in the process of resurrecting his career after a defeat to GGG back in May 2015. In the press conference on Monday, Saunders hailed Monroe a “quitter” in reference to his evident surrender against the hard-hitting Kazakh, Golovkin. Billy Joe Saunders has been concerningly inactive since he was crowned champion in 2015, his solitary defence coming in an unconvincing display against unknown Russian, Artur Akavov. Saunders has frequently vowed to unify the division and promoter Frank Warren has twice come close to finalising a fight with either GGG or Canelo, but Billy Joe’s repeated injury setbacks have for now scuppered those plans. London’s CopperBox arena will play host to the fight with Monroe on September 16. 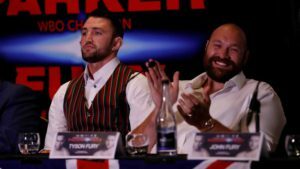 September is due to be a busy month for Britain’s fighters as the Heavyweight clash between Hughie Fury and Joseph Parker is now back on after a cancellation earlier in year. Originally, the fight was due to take place in New Zealand, but the Manchester Arena is the new venue for the Heavyweight showdown. Hughie, cousin of Tyson, is a slick point scoring fighter who possesses an impressive 20-0 record at just 22 years old. WBO Champion, Parker will enter the fight as favourite, but the Fury camp are certainly no strangers to the underdog status and they will take courage from Parker’s most recent bout as he failed to topple the uninspiring Romanian, Razvan Cojanu. Manchester based Hughie has this week claimed that he, for the first time in his career, feels at full fitness. Plagued by health issues throughout his teens, Fury is looking and feeling healthier and is convinced it’s his time to make his mark on the Heavyweight scene and bring the WBO strap back in to the Fury family. “It doesn’t matter where I fight Parker in the world, I know my ability and what I’m capable of achieving and I know I can win the world title.”I don’t like to count my chickens, but the obvious incentive to beat Parker is the big fights out there like a unification against Joshua or Wilder. Meanwhile, we still await confirmation of Wladimir Klitschko triggering his rematch clause with Anthony Joshua, but Eddie Hearn and his Matchroom staff were in Vegas last week looking at potential venues for the fight. Let’s hope we have an announcement in the coming weeks! 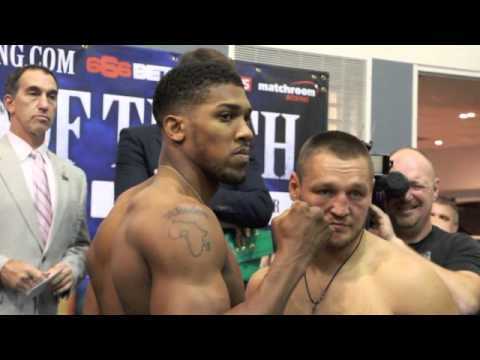 Rising star – and IBF heavyweight champ Anthony Joshua is about to be a regular on American television. Indeed, the British knockout artist, who boasts an impressive 16-0 record (all 16 wins by KO), has signed a multi-bout deal with Showtime television. Joshua’s premiere will be in June when he faces 17-0 Dominic Breazeale (all but two wins by KO) from London in a title fight. Although not a major bout, it will serve to showcase the domineering Brit before a larger audience. Showtime announced the deal earlier this week, to some fanfare. A gold medal winner in the 2012 Olympics, Joshua has been on the radar of serious American fight fans for a while now. Thanks to his impressive resume and ring finishes, Showtime now clearly feels it’s time to try to bring out a new heavyweight star in the form of the Hertfordshire native. Indeed, American fans haven’t followed a heavyweight with genuine interest in close to a generation. Sure enough, America hasn’t been keen on the heavyweight division since the Tyson-Holyfied-Lewis era. Longtime champion Wladimir Klitschko, though dominant, proved to be a bit dull for North American tastes. A new heavyweight era, however, seems to be dawning. For Klitschko was bested by Joshua’s countryman, Tyson Fury, last year, which led to a breakup of the title scene in the big man’s division. What’s more, the rise of fighters like Deontay Wilder, Luis Ortiz and Joshua himself has generated heat within the heavyweight ranks. Although all of these new breed heavies have some question marks hovering over their individual abilities, Joshua has started being regarded by analysts as the best of the bunch. And now Showtime clearly wants in on the Anthony Joshua business. It may well prove to be the right move at the right time. Showtime, after all, appeared to be all but out of the boxing business not so long ago. It’s returned to being a significant force in boxing in recent months, however, and the signing of Joshua may be a sign as to just how seriously invested Showtime now is in the sweet science. Meanwhile, HBO, under rumors of serious budget cuts, has been showing less than thrilling matchups recently. What’s more, it appears to be relying more heavily on pay per view cards, as is evidenced by the recent announcement of the upcoming Bud Crawford – Viktor Postol junior welterweight matchup on pay per view. Showtime appears ready to fill at least some of the void. For Joshua can only be seen as a long term investment for the network. He also may prove to be a very lucrative investment if he has a showdown with fellow Showtime heavyweight titlist Wilder. Indeed, that match at first blush has the makings of one that might generate considerable interest among fans. Both fighters are thunderous punchers with bodybuilder physiques and unique backstories. Add in Wilder’s charismatic personality and there’s the makings of fairly big deal. Would the fight determine who the best heavyweight in the world, was, though? The answer, sadly, is no. As good as it will be for American fans to have easier access to Joshua fights, the fact remains that a deal with Showtime might lessen the chances of Joshua facing the likes of Ortiz or the winner of the impending Fury-Klitschko rematch any time soon. Yet the operative word here is “might.” Boxing politics have certainly damaged the sport, but it may be reasonable to suspect that even boxing’s stubborn fiefdoms will eventually realize there’s more money to be found in unity than there is in Balkanization. Let’s hope the powers that be come to their senses sooner rather than later now that things have become interesting in the heavyweight division for what is essentially the first time in years.